In Adventures in Middle-earth the greatest fantasy setting of all time comes to the world's favourite rolplaying game rules! Smaug has been defeated, the Battle of Five Armies has been won, and Bilbo has returned to the Shire. But much danger still remains, and from the Orc-holds of the mountains to the dark and corrupt depths of Mirkwood a darkness waits, recovering its strength, laying its plans, and slowly extending its shadow. In Dale, King Bard sends out a call for brave adventurers to journey to Lake-town and assist him in resoring the glory of the North. Adventures from all the Free Peloples of Wilderland and beyond arrive to heed the call to adventure. Spurred on by diverse callings - whether it be the lure of the road, the hunger for ancient lore, or the simple urge to defend hearth and kin, adventurers are preparing to explore Middle-earth and to battle the rising thrust of The Shadow wherever it may be found. 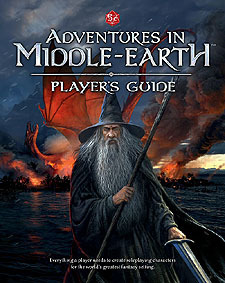 This Player's Guide gives you the Middle-earth setting-specific rules and guidance to create your characters and adventure in the world of The Hobbit and The Lord of the Rings using the OGL ruleset. Character creation features Cultures and Classes designed for Middle-earth to help you get deep into the setting from the very start of your adventures. New rules add excitement to your journeys and encounter, and chart the corruption of the Shadow in the unwary or unwise. The quest begins with this lavishly illustrated, hardcover Adventures in Middle-earth Player's Guide followed by the Adventures in Middle-earth Loremaster's Guide. You can start playing right away with this Player's Guide, and the latest edition of the world's most popular roleplaying game rules.